Ultimate Luxury Pool & Backyard in Potomac, MD - Land & Water Design, Inc.
As we share our favorite projects with you, we find ourselves talking about what went into each landscape design. In this example, a whole backyard resort in Potomac, Maryland, it would almost be easier to talk about what ISN’T in it. This project was not a new construction, blank slate lot. The clients had been in the home for a while. Complicating matters (but also providing some wonderful opportunities) was the fact that our homeowners had many large specimen plants. 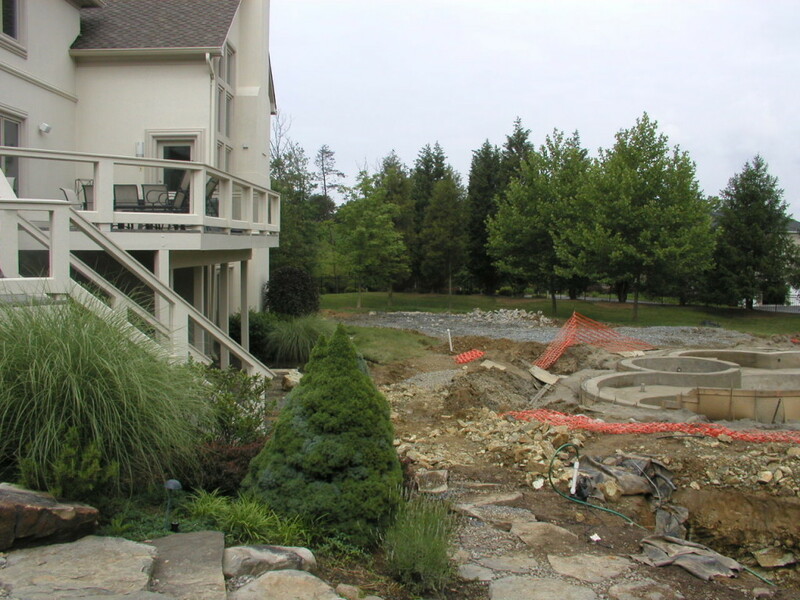 These would prove to be assets, making the finished Potomac landscape design look as though it had been there for a while, but preserving and working with existing material is always a challenge. Space is a luxury that we had on this project. The large pool is the focal point, with a wide entry to the water encouraging swimmers to explore the curves. A spa provides a spot to relax and chat away from the swimming area. A large raised waterfall spills into the pool, appearing to flow from the koi pond above. 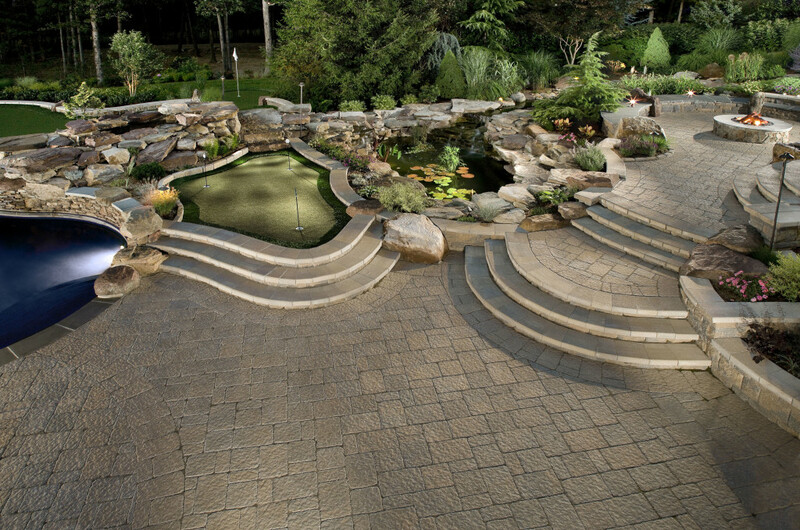 The homeowners had an existing koi pond, and part of the design brief included preserving this feature. We extended a streambed to flow from behind the new outdoor kitchen, all the way to the patio, to spill into the koi pond. With such a large watercourse flowing through the backyard it made the most sense to tie it into the swimming pool. Koi won’t thrive in pool water suitable for humans, so we created a stone bridge across the stream to conceal the fact that the pool and the koi pond were separate systems. The illusion, however, is stunning. 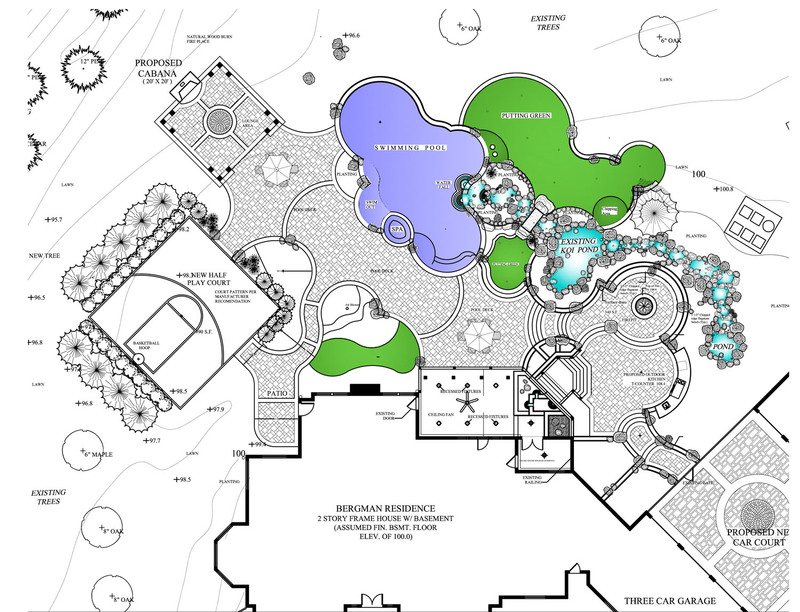 The homeowners lead an active lifestyle, and they wanted play space as a part of their backyard resort. 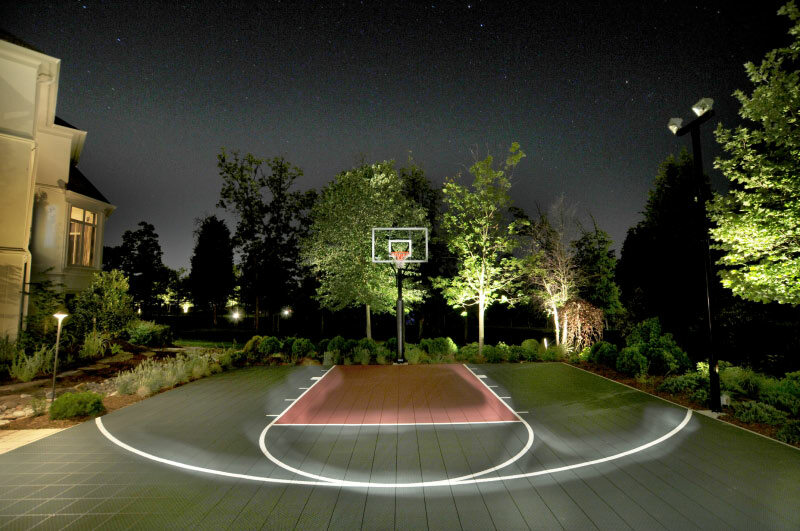 A Sport Court dominates one end of the yard, encouraging guests to grab a ball and start a pickup game. 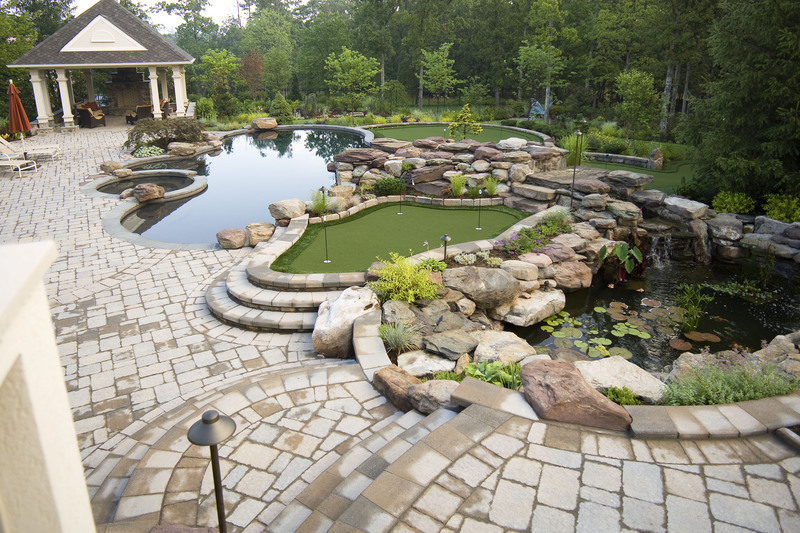 One putting green just didn’t work with the scale of this backyard, so we built several. The greens meander throughout the landscape, and the water features allow the homeowners to hone their chipping skills. 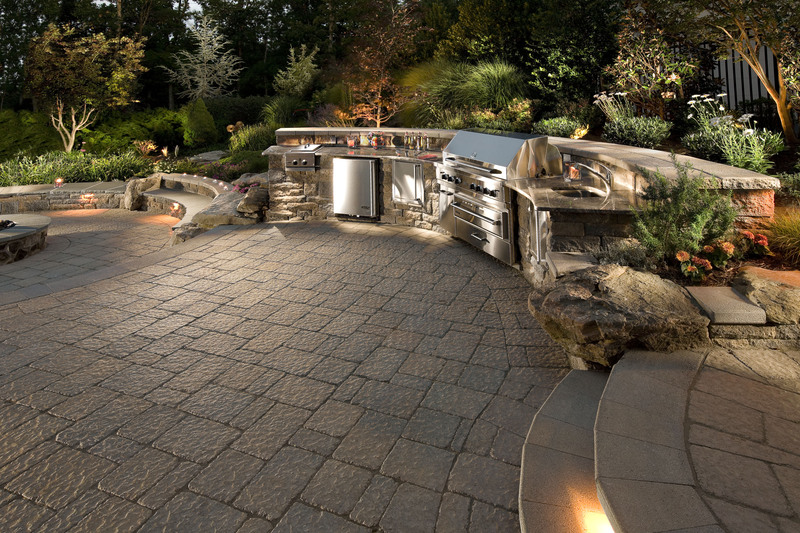 A curved outdoor kitchen sets the stage for meals and entertaining. From the large Viking grill with a warming drawer to the sink and outdoor refrigeration, this kitchen can feed a party – or the family. The gentle arc of the curved kitchen allows all the amenities in a space that still feels human-sized. At the end of a day spent swimming, golfing, playing basketball, and grilling out, it’s wonderful to have a comfortable, intimate space in which to sit back and watch the sunset while a fire roars to life. That is what we created with this pavilion. 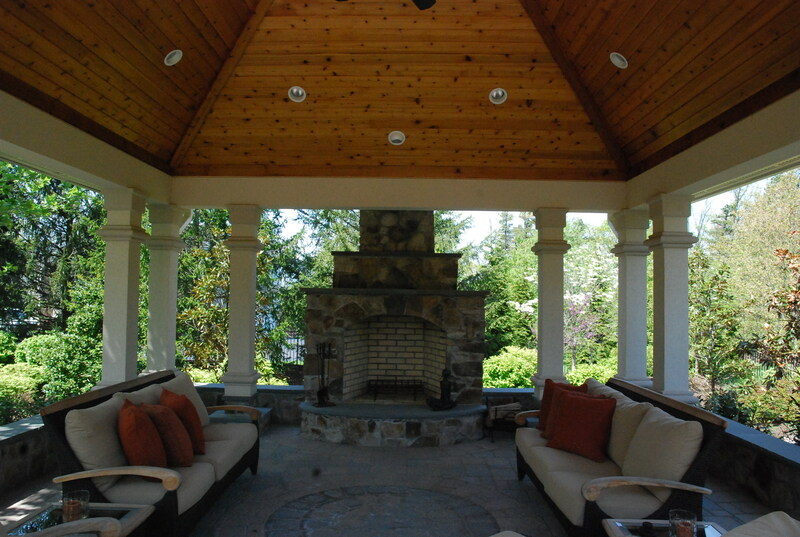 The large roof and beefy columns unite the landscape with the home while creating an outdoor living room that is a destination – not an afterthought. The stone fireplace fills the back wall comfortably, while still allowing views of the yard beyond. 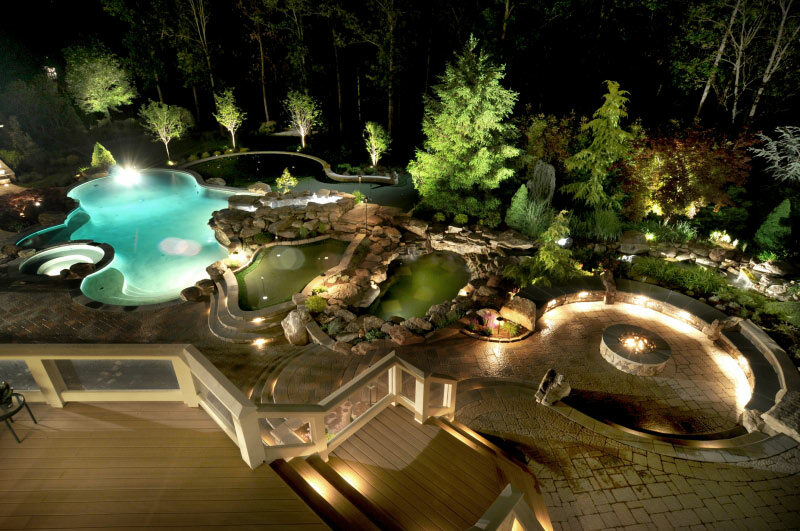 What part of this Potomac, MD pool, and landscape project inspires you? The swimming pool, the putting greens, the pavilion, all of it? We’re excited to learn more about what YOU want in a backyard. 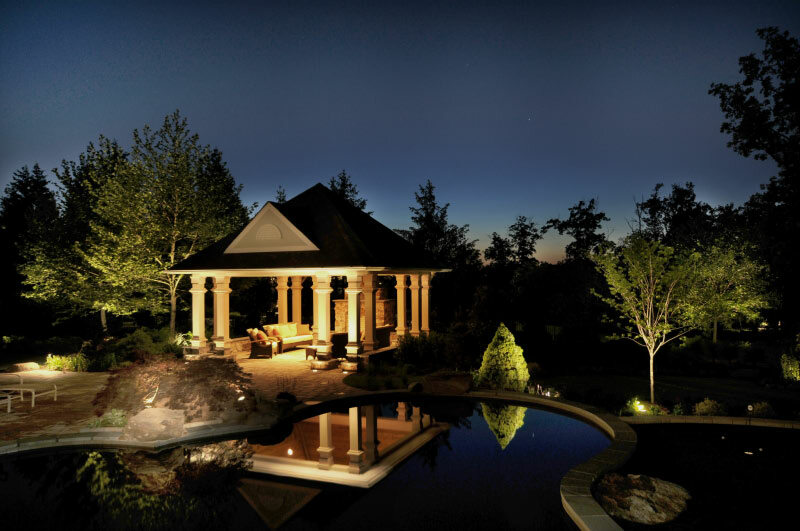 Contact us today to get started on the path to your dream backyard.